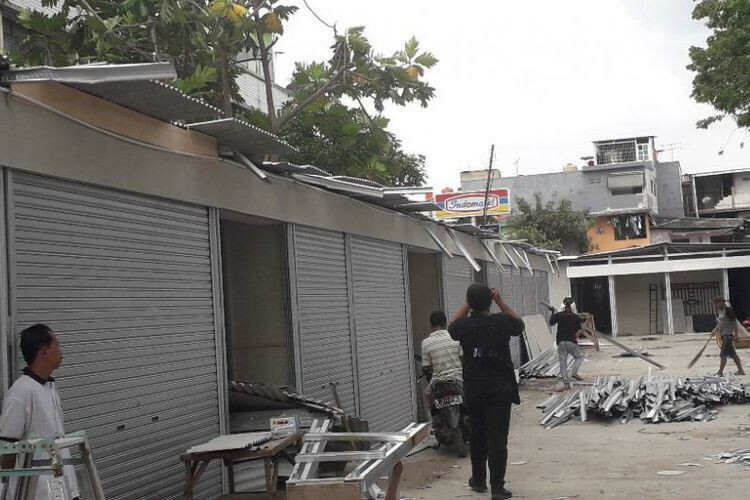 Strong winds that lasted for 10 seconds destroyed 22 kiosks at Tanah Merah Market in Penjaringan, North Jakarta, on Tuesday morning. Penjaringan subdistrict head Depika Romadi said the kiosks were still under construction. “They are not entire buildings but the kiosks’ building frames. The wind blew and they collapsed,” he said as quoted by kompas.com. Depika said construction would continue despite the setback. A complex of kiosks at the market is expected to accommodate 400 merchants. One-hundred kiosks currently operate at the site. A worker on the kiosk construction site, Eko, said the incident occurred at 10:30 a.m.
“The wind came out of the blue. It lasted for 10 seconds. We were working when it happened. We were installing the walls,” he explained.